A year and a half later, Zac and I are sitting in Salvatore’s apartment with his girlfriend Silvia waiting for him to return from work. Their apartment has tall, open windows, is full of light and plants and two fish: a bright blue fighting fish and a goldfish. We’ve already discovered that Silvia is from the same small Canadian town that our good friend Carol is from–it’s a small world, as the saying goes. And then Salvatore comes home. He has an Australian accent which I love, is a little bit shorter than me and very muscular, strong. His eyes remind me of my father’s eyes, a lovely almond brown. Here in front of me, my second cousin on the Scarpino side of my family. A man I didn’t know exists. 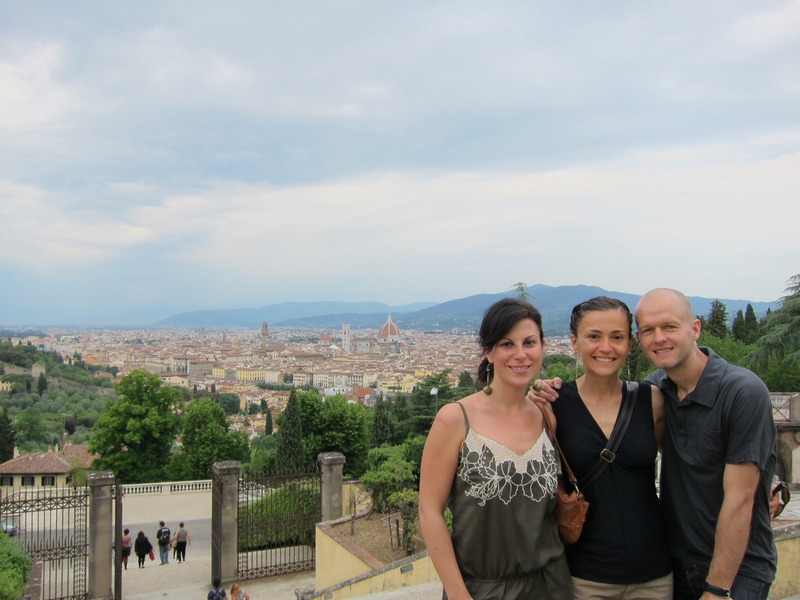 That night, he takes us on a tour of Florence–the Duomo, the Ponte Vecchio, Medici family buildings. We eat an amazing pasta with fresh sauce that Silvia makes from tomatoes on the vine, olive oil, and bright green basil. We eat the best olives I’ve ever eaten–salt cured, but plump and full, oily–totally unlike the dry salt-cured olives in the US. The next day, Silvia takes us on a walk up a hilly overlook showing all of Florence below us, and just as we reach a church on the top of the hill, a black Audi decorated with white lace pulls up. A wedding; the bride has arrived. We drink white wine on a terrace overlooking the city, orange-red tile roofs and lush green trees and the constant whiz of scooters and cars and people. Florence is lovely in every way, and Zac and I are already scheming ways to return, to stay for an entire summer perhaps. For the first time in as long as I can remember, I feel relaxed, at ease, untroubled. We sleep until 11 in the morning. But the best thing is having found new family–Salvatore and Silvia argue over which of his sisters I look the most like. And in his Sal’s eyes, I see my father. Oh, how wonderful! Florence is my absolute favorite city in the entire world. So lovely, Andrea! Like a beautiful dream that will now be a part of you forever — the Internet has opened the world to people in so many ways.